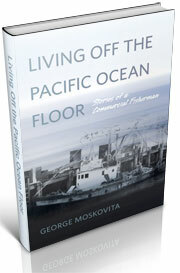 I’ve been reading a fascinating little book, Living off the Pacific Ocean Floor, Memoir and Stories by Captain George Moskovita. And while George says he was catching Pacific Ocean Perch, he means Rosefish, or Rosies, a species of Sebastes rockfish (also known as Pacific ocean perch, or POP, just to make it even more confusing) book is a collective family effort; they taped his stories, then his daughter, Jo Ann Williams, transcribed them. Jo Ann’s husband compiled the text and arranged the pictures, including copies of newspaper stories from the Daily Astorian, the Chinook Observer, and Pacific Fisherman. 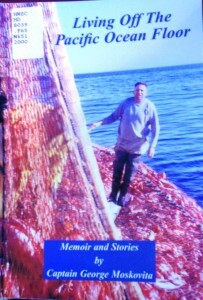 The cover picture shows George standing on a net full of fish; he doesn’t say if it was the 1965 catch of 150,000 pounds. The picture appears to be taken on the ocean, but the water sure looks calm. I’m excited about this little book for several reasons. 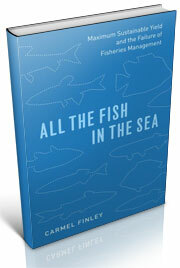 It’s a great read on the volatile days of the early fishery. 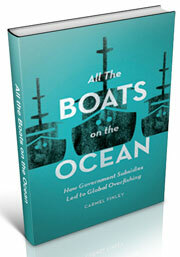 George is everywhere, from fishing tuna off California to crab in Washington, in a variety of boats. He talks about the early days of trawling, fishing for the mink plant in Astoria in the 1950s. But I also really like that his family collaborated with him on the project, bringing together their family history (there were four daughters, and great pictures of them, in matching costumes, singing at annual Christmas festivals in Astoria). It’s a project that more fishing families should consider doing, especially now that software makes these sorts of projects much easier. This entry was posted in Carmel Finley, Environmental History, Fishing, George Moskovita, History of Science, History of Technology, Maritime History, Ocean fishing, Pacific Fishing History Project, Rosefish, Sebastes rockfish and tagged Astoria, Fishing, mink plant, Pacific Ocean, Pacific Ocean Perch, Rose fish, trawling. Bookmark the permalink.